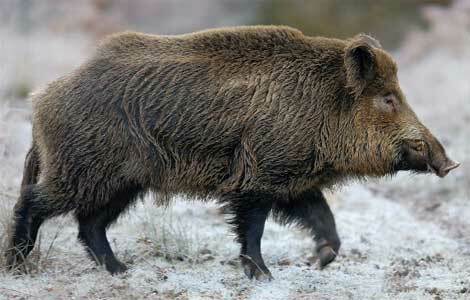 A big wild pig ran loose in Berlin, injuring at least for people, according to reports. Berlin authorities said they shot and killed a 120 kg or 265 pound pig after it attacked and injured four people, including a police officer in a residential neighborhood in Berlin. Police said Tuesday that the pig bit a 74-years-old man in the back and leg and slammed a 74-years-old woman, to the ground and injured her hip on Monday afternoon in the Charlottenburg area of the capital. Also bit was a woman of 24 years old, before she climbed aboard a parked car to safety. All three were treated at a hospital. Police said that when a police officer arrived, the boar attacked him and cut his leg before he drew his pistol and killed the animal with multiple shots. The wild boars are relatively common in Berlin's green, but rarely cause problems beyond destroying some gardens.